Visible crew/equipment: In the opening scene, when Inspector Blake informs Stan and Arthur that the 10:45 bus has arrived, the camera pans over to the door of the bus where another cameraman's shadow can be seen on the side of the bus. Factual error: In the Edwardian street scene a modern car can be seen behind the cart on the left of the screen - a beige Morris 1800, 1968-1972 model. Continuity mistake: At the end when Stan comes out of the manager's office to explain what happened when the bus got stuck under the low bridge, Stan and Jack drive out in the same bus that hit the bridge which was badly damaged but now is suddenly repaired. 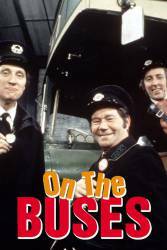 Trivia: Even though Doris Hare played Reg Varney's mother in the series, she was only 11 years older than him.